Open to all amateur athletes who possess a current INBF/WNBF card. Athletes must be 7 years drug free from the date of show, and must submit to a polygraph test. Pro card winners must submit to a urinalysis after they come off stage as required by WNBF rules. INBF registration is available online at: https//www.worldnaturalbb.com/join-inbf-2/. Contact the GSO by email at: gsobodybuild@comcast.net to request an Entry Packet. Call LJTurtle for a drug testing appointment time at (603) 659-2288. Book your hotel and tanning appointments. 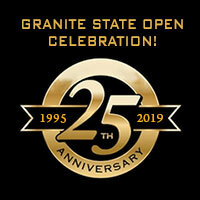 All athletes will be drug tested by appointment on Friday October 25th and Saturday October 26th from 10am to 8pm at the Holiday Inn, 300 Woodbury Ave, Portsmouth NH. In person: $60.00 polygraph fee required (paid to examiner in cash or money order). No fees will be refunded if you fail agreed upon testing procedures. No Walk-In Entries Accepted on October 27th.